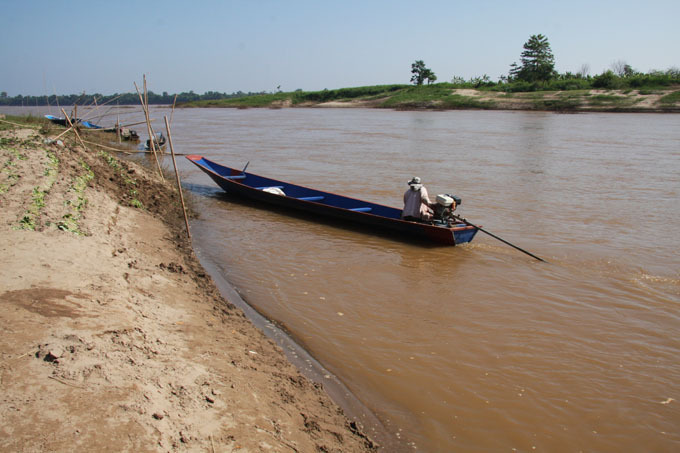 We travelled down the minor road that follows the Mekong towards Don Tan following Aree, Chris and Mary. On the way we stopped off at a small village, which was a point where ferries (long tailed boats) dropped off workers from Laos to work for the day. They then go back in the evening …. sort of commuting. Laos people accept lower wages than local Thais. It must be hard living in Laos as wages are lower but many things are more expensive there. While we were walking around by the village a man came and wanted to show us the local temple. Every village has one, and the local people are very proud of them. 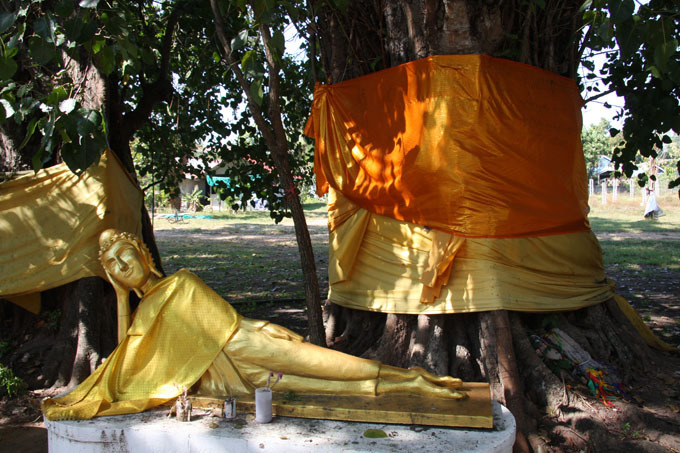 This one had trees that were said to be over 700 years old and a more unusual reclining Buddha. We carried on down the road and visited a fish farm on the Mekong. 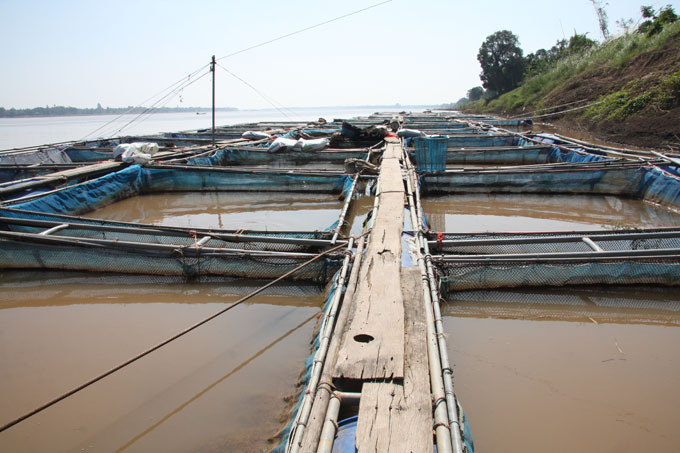 They had big problems this year as the Mekong rose over 6m and stayed there for 3 months! Many fish died as the high levels of silt blocked their gills. They had an ingenious way of bringing the fish up to the top of the bank. 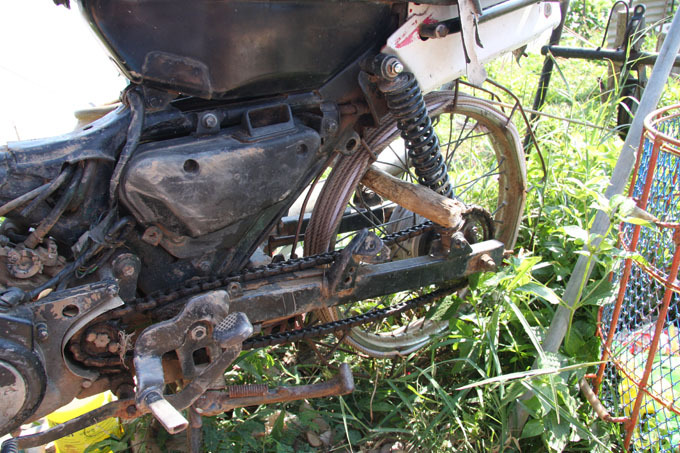 There was a pulley system connected to an old motorcycle. I can think of a few gardens in our village which could do with a similar system! We had coffee with Chris, Aree and Mary and then went our separate ways. We had great fun with them in Mukdahan and we will definitely try to stay in touch in England and maybe even in Thailand again! Lets hope so. Mukdahan was another place that we had never heard of, but will never forget. We also enjoyed meeting Tesco Mick, Edith, Sal, Noy and ‘Miss fix it’, Jang. 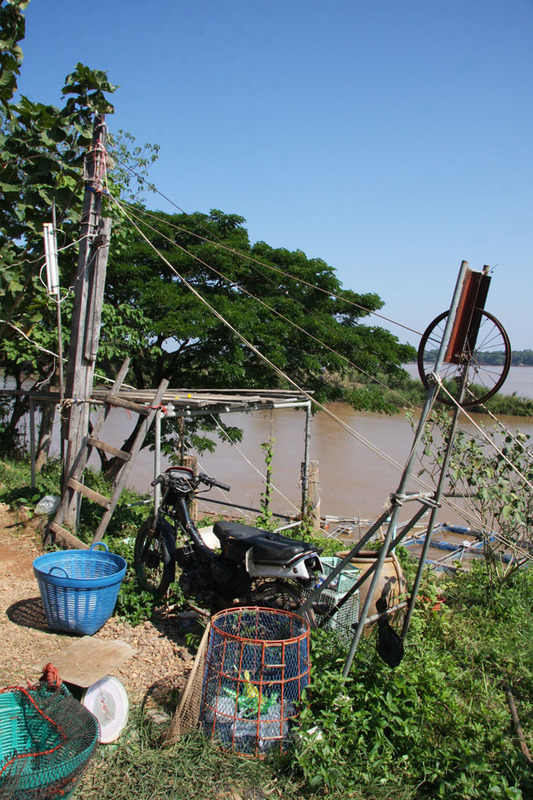 We drove on do to Khema Rat and stayed the night right next to the Mekong near the ferry terminal. Great place to stop, quiet and a short walk to shops if you need them (including 7 Eleven).